I have this crazy tendency to want to read authors works in order, especially if I try a new release and like it. Having read and really enjoyed the last three new books by Elizabeth Chadwick, it was time to go back to the beginning and start glomming the back list, and you can't get any more back than this book - the first book published by Elizabeth Chadwick. In fact, this book has been out of print for a long time and for a while there I very much lamented the fact that I couldn't find a reasonably priced copy anywhere, until I finally lucked out on Ebay and bought a copy from the UK. Fast forward just under two years and I finally managed to read it, and quite frankly I don't know what I was thinking of waiting so long to do so! The book opens with Guyon somewhat reluctantly having to marry a young girl, at the persuasive encouragement (or perhaps less encouragement than given no choice) of King William Rufus. By doing so, he is able to protect his own inheritance but also gets to stop his enemy Robert de Belleme from gaining further. The young girl is Judith of Ravenstow, and de Belleme is her paternal uncle who has his eye on her land. The young couple therefore marry hastily without having ever met each other previously. Guyon is handsome and sophisticated, with an established reputation at court as something of a romancer. For all Guyon's experience, Judith is an innocent, perhaps unusually so. She is well trained at the arts of healing and in the other skills required in order to run a household, but when it comes to interaction with the males of the species, she only has the abusive example of how her father treated her mother and she is skittish to say the least. Guyon is prepared to be patient with Judith, until she is ready to deal with him as her husband, but as the relationship deepens between them, so the conflicts in the Marches and the Royal Court also deepen with Guyon getting caught up in the plotting and battling that is endemic in the court at the end of the 11th century and beginning of the 12th century. It is hard not to compare this first book of Chadwick's with the later books because in many ways they are very different. There is less balance between the relationship between the characters and the battles and politics of medieval England. I think the sexual tension and the build up to the consummation of the marriage is less subtle than we see in her later books. The language of the novel is much less concise and at times there is too much description. Having said all of that, the story itself was excellent, and I certainly was enchanted by Guyon. What Chadwick hasn't done with this character is made him whiter than snow. He is known at Court for his liaisons with the ladies, and very early on in the novel we know that he is prepared to take care of his responsibilities in this regard. We also know that he is a man of honour, and of faithfulness once he is married. He is in fact an all round good guy. If not for his past indiscretions there would be a chance that he would be too good to be true, but I can live with that. In fact, I wonder if I was to venture out to the Welsh Marches today whether I would be able to find my own Guyon - good looking, honourable, courageous. Yes please! The same can not be said for the bad guys who are all very bad, but again this is something that I was willing to forgive because the actual story itself is so good! Elizabeth Chadwick has confirmed that this book and the two others that form part of the Ravenstow trilogy are being rereleased after having been edited. In the case of this book, there have been approx 15000 words cut out of it, so it will be interesting at some stage to read the new version and see how it holds up to the revisions. The new version of the book is being released in the UK in December, and the cover is to the right, and fits in beautifully with the cover treatment that her newer books are receiving. 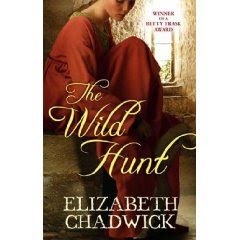 This is another winner from Elizabeth Chadwick, and I am very much looking forward to reading the other two books in this trilogy. Review originally posted in July 2008. Oh I read this one too and I remember loving it! Your review brought the book back to me:) I'm so happy to hear that it's going into reprint- lovely news- I'd read it again:) Thanks, Marg!